Happy Tuesday everyone! 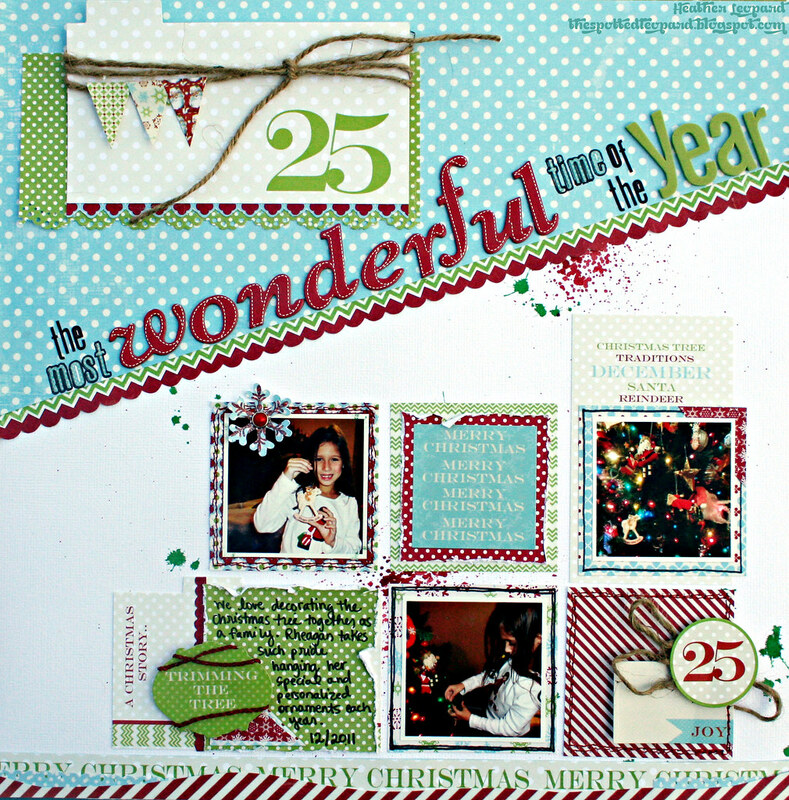 I wanted to show you a layout I did based on this week's sketch by Cindy Liebel on the Lily Bee blog. I just love the Christmas Cheer collection Lily Bee sent me to play with. It's soo pretty and the colors are bright & cheery. Creative How-to: Visit the Lily Bee blog to see the sketch and get details for playing along in the challenge. The first thing I did after choosing my photos was to pick the main papers I'd be using. These are my base, which is white, and the blue/white polka dot Figgy Pudding paper. I then measured and cut my squares and placed them on the white. I laid the blue paper over all of that and marked the two spots for the angle, leaving room to add the zig zag and scallop border. Once I cut and adhered it, I added the index journaling card at the top with a little layering, jute and banners. Then, I embellished my squares with layers, stitching, doodling, index journaling cards sticking up and out, stickers and more... I also added a border at the bottom using the same colors and the Merry Christmas sentiment to tie everything together. As always, thanks so much for stopping by today! Please head over to the Lily Bee blog to see the sketch and get the deets on how to play along! This is GORGEOUS! I loveeeeeeeeeee the photos, the title work and loving the squares!!! I Loved your page... this is very beautiful! FANTASTIC take on the sketch Heather! I love how you used the grid design with the angles to break it up a bit! I love the layout of everything on your neat looking layout. Cute with the little square photos. Love the angled title! Great page! This is adorable Heather!! Love the way you tilted the title and added the square photos with the square pp's!! Love love love this page! The design is fantastic and I just love the colours! !